How do we shift norms and create a culture where patient and family engagement is the rule, not the exception? What are the ways in which legislation, regulations, and policy changes come into play? 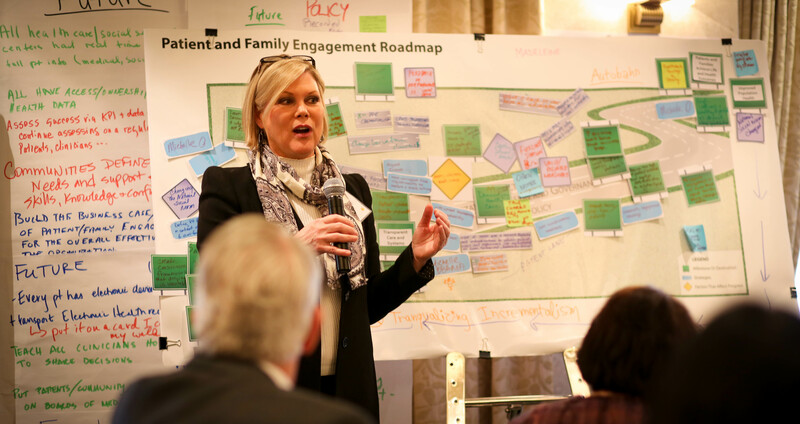 The impetus for developing a Roadmap for Patient + Family Engagement in Healthcare grew from several issues. First, the broader concept of patient and family engagement in healthcare is not new. In one form or another it has been advocated and written about for at least 30 years. Second, the scientific evidence documenting the benefits of engagement and the public’s desire for it has grown exponentially. And yet, at present state there are pockets of excellence in the healthcare delivery system, but no one can point to a place where patient and family engagement and partnership is the default at all levels of care, as well as in organizational design and governance. Engagement in health policy making similarly remains the rare exception rather than rule. Some of my own experiences and findings as a patient and researcher illustrate the depth of the challenge. I was diagnosed with Type 1 diabetes in Germany in 1988. Immediately following my diagnosis and stabilization I participated in a five-day training that taught me everything I needed to know to be able to effectively self-manage the condition, while giving me the flexibility to live in a way that was consistent with my tastes and preferences. I wasn’t a model patient right away, but a few years after my diagnosis when the light went on in my head, I had all of the skills and knowledge I needed to pay closer attention. And today, 27 years later, I still have no complications from the condition. I must be doing something right. Just a few years ago I saw an ophthalmologist for an annual eye exam who gave me the answer. After a few quiet minutes of conducting the exam, the doctor said: “everything looks great, you have no trace of retinopathy” (typically you might expect to see damage after 10 years, in my case this was after 23 years). Her conclusion? You must be really good at following orders! I was taken aback that she could possibly think I was doing all I do to manage my diabetes for her, but my doctor clearly had a different interpretation of what patient-centered care and patient engagement mean. My research has similarly documented the challenges that patients who want to be engaged face. In a series of six focus groups we asked older patients (50+) to tell us about their experiences making medical decisions with their doctors. Although they probably shouldn’t have, our findings surprised us. Patients told us they were worried about being labeled as “difficult” if they asked too many questions or dared to disagree with a recommendation from a physician. And if they were labeled “difficult” they worried that they would receive lower quality care in the future. In other work we described the challenges we faced when we attempted to implement decision support for patients in primary care. Most everyone agreed with the basic premise of informing and involving patients in making choices about their care, but when it came to making this the default in practice, we learned that we still have a long way to go. A number of other studies have similarly documented the challenges we face in broadly implementing decision support for patients. The concept of patient and family engagement has never received as much attention as it does today. In part, this reflects the accumulation of knowledge and advocacy, but it also demonstrates the power of policy with the Affordable Care Act explicitly focusing on engagement in a number of provisions. In addition, the introduction of Accountable Care Organizations has shifted the incentives in favor of engagement. Similarly, the state of Massachusetts has mandated that every hospital must have a patient and family advisory council. Patient and family engagement is not one but many things. It’s about the things individual patients and healthcare professionals do, but it’s also about broader systemic change. The history of engagement to date suggests that we can’t just rely on individuals to change if we really want to see systemic change. We look forward to discussing the role of policy and regulation in advancing patient and family engagement at 8:30pm Eastern time on January 27th(for your local time click here). We hope you can join us for the #HCLDR Twitter chat! T1 Do current healthcare policies/regulations help, hurt or ignore patient & family engagement? T3 How can we ensure patients, families & clinicians have a voice in creating new policies? T4 How can patient & family engagement be measured so that we know we’re making a difference? Unless and until clinicians ( and the provider organizations they are aligned with) commit to learning how to think and communicate in a patient-centered style, I don’t see how any meaningful progress can be made in implementing patient-centered care in any meaningful fashion as called for by ACA or IOM. Join the Moore Foundation and #hcldr this Tuesday 830p E for a very special conversation on Patients and Family Engagement in Healthcare. Looking forward to continued conversation about patient engagement. I continue to want to learn about and problem solve the “business” of healthcare versus the “business” of engaging with others. ← Personal Health Data and the Doctor-Patient Relationship: Are We Missing Something?